Over 40 years of industry experience. 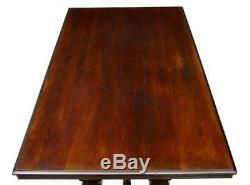 UNUSUAL ARTS AND CRAFTS 19TH CENTURY CARVED WALNUT LIBRARY TABLE. RARE LIBRARY TABLE FROM THE PRIVATE COLLECTION OF King Gustaf VI Adolf of SWEDEN. 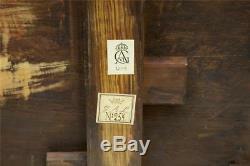 LABELLED UNDERNEATH WITH THE ROYAL MARKS AND FOR ITS RELEASE FOR SALE. 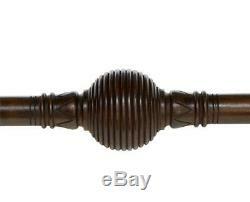 SWEDISH ARTS AND CRAFTS WITH EASTERN TASTE, CARVED CURVED LEGS UNITED BY TURNED STRETCHER. STANDING ON WOODEN BALL CASTORS. TOP WOULD REQUIRE REPOLISHING IF WANTED IN A1 CONDITION. HEIGHT: 29" WIDTH: 46 3/4" DEPTH: 28. Excluding Highlands & Islands of Scotland, Northern Ireland, Isle of Man, Isles of Scilly, Jersey & Guernsey. Europe & Rest of UK. Austria, Belgium, Bulgaria, Croatia, Czech Republic, Denmark, Estonia, Finland, France, Germany, Greece, Hungary, Ireland, Italy, Latvia, Lithuania, Luxembourg, Netherlands, Poland, Portugal, Romania, Slovakia, Slovenia, Spain, Sweden. Also Highlands & Islands of Scotland, Northern Ireland, Isle of Man, Isles of Scilly, Jersey & Guernsey. 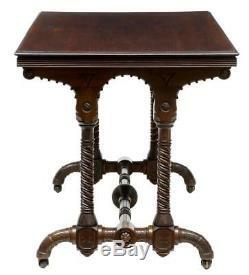 The item "UNUSUAL ARTS AND CRAFTS 19TH CENTURY CARVED WALNUT LIBRARY TABLE" is in sale since Tuesday, April 14, 2015. 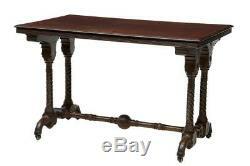 This item is in the category "Antiques\Antique Furniture\Tables\Victorian (1837-1901)". 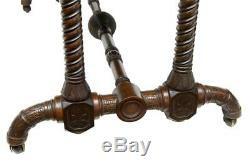 The seller is "debenhamantiques" and is located in Debenham. This item can be shipped worldwide.